Peru has an incredible cultural legacy, expressed in various manners, which are a source of pride not only to Peruvians, but to the entire world. 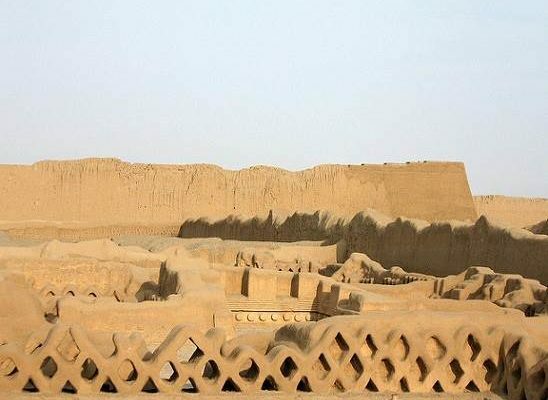 Such is the case of Chan Chan, the largest urban center made out of pre-Columbian American adobe, and declared a World Heritage Site by UNESCO in 1986. 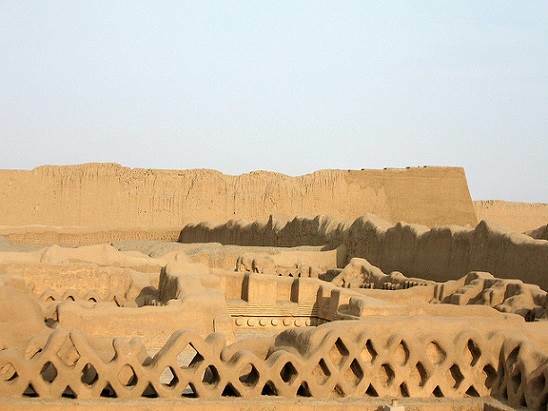 Chan Chan, which means “Dazzling Sun” due to the intense exposure to sunlight that one feels on the site, was founded during the Tacaynamo’s reign, sovereign of the Chimu Culture, developed during the years 900-1470 AD. The urban center of more than 7.7 square miles is made up of more than ten citadels or large rectangular enclosures, which in turn are shaped as small walled cities. These are: Squier, Gran Chimú, Bandelier, Uhle, Chayhuac, Tschudi, Rivero, Laberinto, Tello and Velarde. Each of them is divided in three sectors. The north one was a plaza, with walls that were not very high which were used for sitting down. In the middle were the warehouse and the “Royal Mausoleums,” a kind of cemetery for the main rulers of each citadel. And to the south, the residential area, with kitchen, bedrooms and water well for all inhabitants to use. The archaeological site of Chan Chan is located 3 miles from Trujillo – also known as the city of eternal spring, due to its sunny climate and festive environment – in the region of La Libertad, which is in the northern part of the country. Leaving from Lima, there are two ways to go to the city. The first way is by land, through the Pan-American Highway North, which will take approximately eight hours. The second option is to do it by plane to Trujillo’s International Airport Capitán FAP Carlos Martínez de Pinillos, which will take between 45 and 50 minutes. From there, hop on a tour bus that will take you directly to Chan Chan in only ten minutes. Travel agencies such as Guia Tours organize trips from two days and one night, which include airfare, transport, lodging and the tour through Chan Chan with professional guides, which lasts approximately two hours, and other Trujillan attractions, like the beaches of Huancaco – famous for the fisherman who travel on totora reeds – and the Plaza de Armas (Main Square) of Trujillo. One of the city’s best places to stay is the hotel Las Palmera (1150 Larco Avenue), in front of the Huanchaco beach, ten minutes from Chan Chan and five minutes from the Main Square; with amenities such as pool, restaurant, conference room and internet access. You can also stay the El Brujo Hotel (170 Santa Teresa de Jesus street, La Merced development), in the most exclusive area of the city, with special rooms for business travelers, in addition to bar, restaurant, safe box, internet and business center services. And to sample the exquisite gastronomy of Trujillo one must go to El Mochica (462 Bolivar avenue), famous for hosting typical music concerts and for its Patasca (a hearty soup), Picante de Cuy (Guinea Pig dish), Cebiche Mixto (fish and seafood ceviche) and Arroz con Mariscos (rice with seafood) accompanied by the indispensable chicha de jora (fermented light maize drink).Likewise, at the restaurant SKBCH Cocinas y Bar (515 Pedro Urraca street, San Andres 2nd stage development) one can find the best fusion dishes of the northern Peruvian and international foods. Good enough to lick your fingers. Since Trujillo has a sunny climate year-round, you must bring light clothes, hat or cap, sun glasses, sun block and lots of mosquito repellent, which tend to be more bothersome at nighttime. Of course, since Chan Chan is very close to the beach of Huanchaco, we cannot forget to bring bathing suits, beach towel and beach wrap.